THIS MAP SHOWS THE NORTH SHORE FROM THE VERRAZANO BRIDGE TO HOWLAND HOOK TERMINAL. 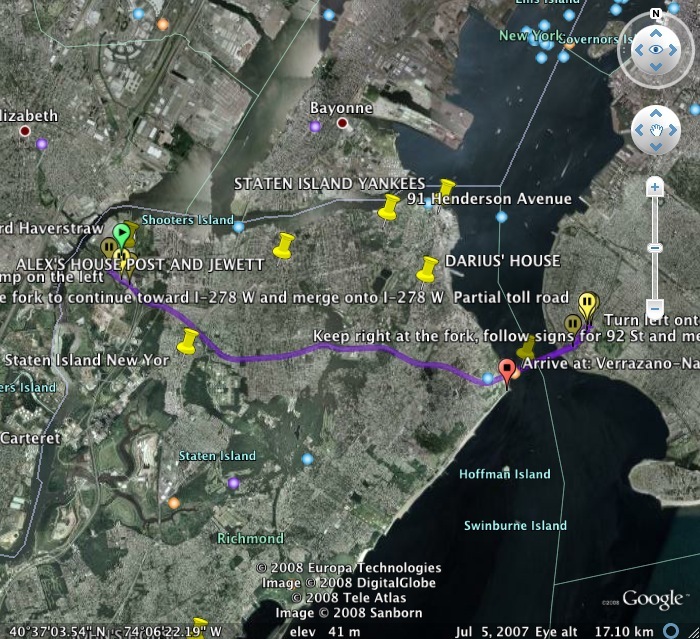 WE ALSO USED GOOGLE EARTH TO LOCATE OUR SCHOOL AND HOUSES ON STATEN ISLAND. TURNS OUT EVERYONE LIVES ON THE NORTH SHORE OF STATEN ISLAND. WE ALSO LEARNED THAT THE NORTH SHORE IS EVENLY RACIALLY MIXED. ABOUT ONE THIRD AFRICAN-AMERICAN, ONE THIRD HISPANIC AND ONE THIRD WHITE. ALL RACES LIVE ON THE NORTH SHORE OF STATEN ISLAND. ~ by stufffromthelab on July 7, 2008. The Summer the Town Bit Back! Ice Cream and How to write a business letter: a Perfect Match!